These lines are from "Winter in America," a Gil Scott-Heron song from 1974 that inspired a Hank Willis Thomas video, which in turn inspired an art show at The School, the sprawling gallery in Kinderhook. "Winter in America" runs through April 30. This exhibition space, administered by the Jack Shainman Gallery, resembles a small museum. But museum shows often feel like they were assembled by a committee, and a highly individual eye created this exhibit, juxtaposing photography, painting, original comic book art, installation, carvings by untrained sculptors, and items from the Black Panther archives. Artists from 15 countries contributed works. This is a first-rate showcase available to Hudson Valley art lovers for free. Since it was once Martin Van Buren High School—and is still called "The School"—one expects education, and isn't disappointed! 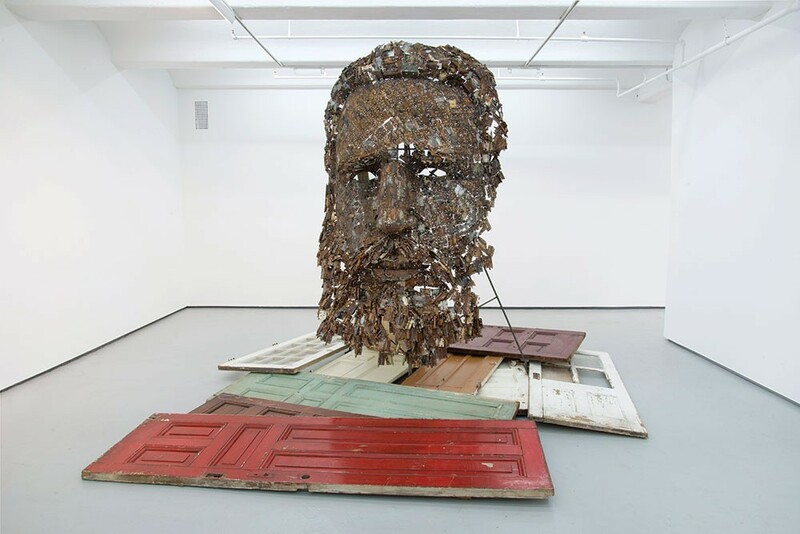 Walking into the gallery, you confront a huge head of Fidel Castro (I thought it was Odysseus) made from hundreds of Cuban door hinges. The sculpture rests on 11 discarded American doors, representing the 11 presidential administrations since Fidel came to power. This is "Immanence" by Yoan Capote, a Cuban installation artist. Down the hall, Francis Mitchell's photograph of Malcolm X (taken from the Panther archives) shows Malcolm with his finger pointing forward, mid-lecture, like a revolutionary history teacher. Destiny is an oil painting of three superimposed images of black incarcerated women named Destiny, painted by Titus Kaphar. (Nearly a third of all the women prisoners in the world are in the US.) This triple-face, which resembles a rolling TV screen, gazes across the room at two Andy Warhol silkscreens of electric chairs—or actually, the same electric chair in two different colors. (And odd colors: light green and mauve.) Is state-sponsored murder Destiny's destiny? A heroic Mark di Suvero titled Chonk On squats on the front lawn, like a playground for five-year-old astrophysicists. This sculpture subtly announces the show-within-a-show of three small di Suvero assemblages and two drawings, one of which is, coincidentally, called Untitled (Wintertime). "You'd be surprised how much the town of Kinderhook has embraced the gallery," Jack Shainman remarks. One connection to the village is Harold Van Santvoord (1863-1913), 11 of whose drawings are in the show. While working as an editor at the Albany Times-Union and contributing to Life magazine, Kinderhook resident Van Santvoord composed absurd limericks that he illustrated with semi-insulting illustrations ("Weary Waggles, though down on his uppers / Fills himself up with booze to the scuppers..."). He was the Hudson Valley Edward Lear! Yet these works were unknown until 2006, when they were discovered in the basement of the Kinderhook Memorial Library. A number of major artists are represented here: Matthew Barney, Larry Clark, Nancy Spero, Carrie Mae Weems, Margaret Bourke-White, Michael Snow. But some of the most powerful artworks are by "Anonymous." One is a small wooden doll hanging from a gallows. His arms are tied behind his back with string, and his back arches in agony. He was carved by an unknown prisoner sometime in the 20th century. Nearby is a jar (still labeled "Salad Dressing") entirely filled with wishbones. An African-American character in Kerry James Marshall's "Rhythm Master" comic strip announces: "Our art was not made for museums or coffee tables. Its purpose is to sustain a people." This could be the epigraph of "Winter in America." "Winter in America" will be exhibited at The School in Kinderhook until April 30. The gallery is open Saturdays, 11am to 5pm. (518) 758-1628; Jackshainman.com/school.